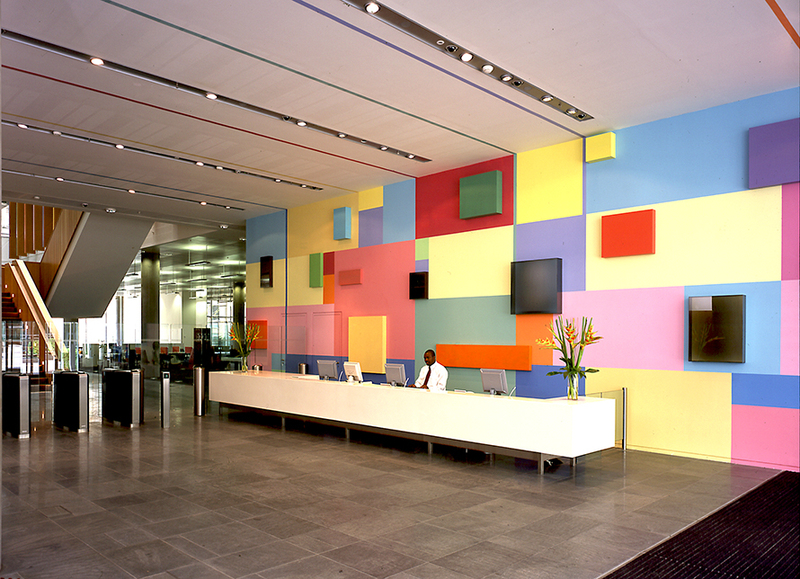 Between September 2001 and December 2002 Art Office’s Isabel Vasseur and Rebecca Ward, conducted an audit of BBC visual art holdings working with the BBCs Robert McPherson and oversaw the creation of a public art strategy for future art commissions. From its inception the BBC was known as a patron of the visual arts. This was made apparent during the construction of Broadcasting House in 1930, with the commissioning of several stone reliefs by the sculptor Eric Gill, including Prospero and Ariel for the building’s Portland Place facade. This was followed in the 1950s by a mural by John Piper for the entrance hall of Television Centre and a sculpture Helios, by TB Huxley Jones, that graced the fountain focal-point in the hole of the Television Centre ‘doughnut’. 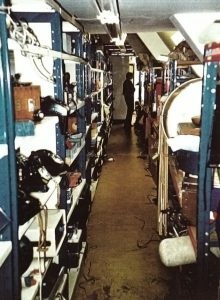 However, during the intervening fifty years little of significance other than commissions connected to its broadcasts had been commissioned and it was felt by key individuals within the BBC management that it was high time this creative commissioning drought be brought to its end. Unfortunately, the timeline for this re-kindling of the BBCs interest in supporting the visual arts traces the arc of change in attitude toward public art around this time. While cultural capital maintained its value in that public art was generally seen as a good thing, the early 2000s saw a switch in approach and a resulting reassessment of the social benefits of public art. Lottery funded galleries and museums appeared in places where there had been none before. Along side these ambitious architectural schemes, more serious attempts were made to present public art as a marker for social cohesion. These tended to be much more integrated within the built environment. Some would not even be recognised as being art at all, but existing somewhere between the disciplines of art and architecture or landscape design. The risk, both critical and financial of commissioning permanent public art within the public sector was considerable. Proposals were expected to conform to disproportionate levels of justification in terms of social context, when frequently this was a secondary motive. Many schemes did not see the light of day, and those that did were directed toward outcomes that addressed political demands, with critical assessment lagging some way behind them, to the detriment of the final work of art. More feasibility studies were done and while permanent works were commissioned, the increase in temporary artworks or ‘built-in’ projects became the norm. This adjustment coincided with the development of the BBC White City site, west London. While the series of commissions planned by Art Office were successful in their final outcomes, changes at the BBC concluded the art programme for BBC Media Village White City somewhat abruptly. 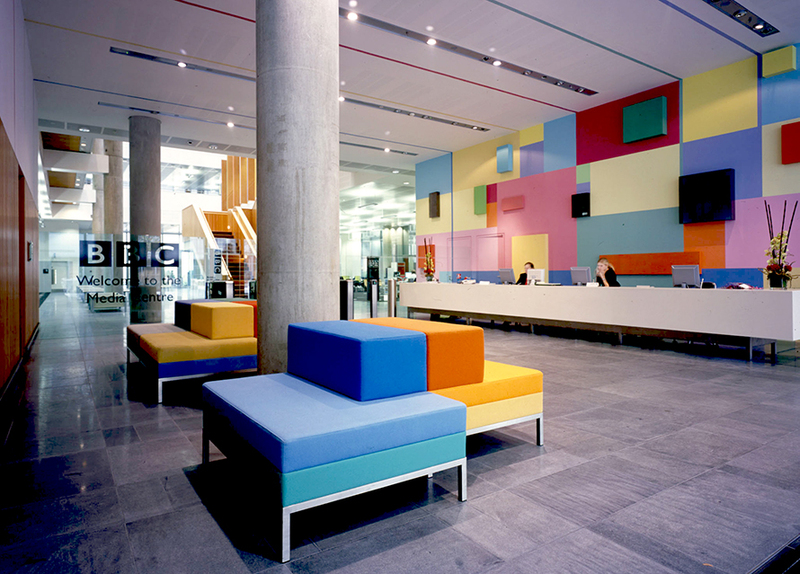 The public art programme was inaugurated in July 2001, with the appointment of artists Tim Head and Yuko Shiraishi working with architects Allies and Morrison on site-specific collaborations at BBC Media Village. 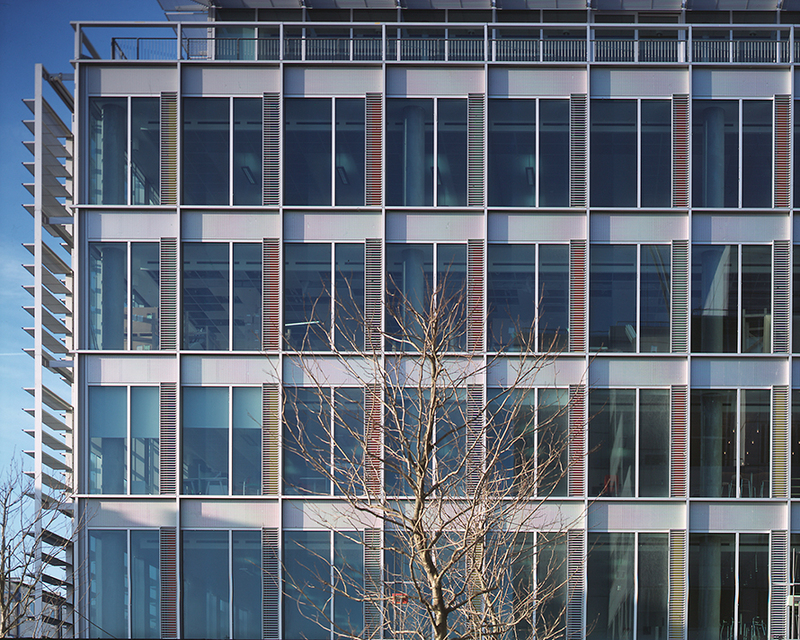 Yuko Shiraishi developed the colour palettes for the interior walls in the two new main buildings, vertical baffles in the form of wooden blades in the atrium and the exterior shutters. 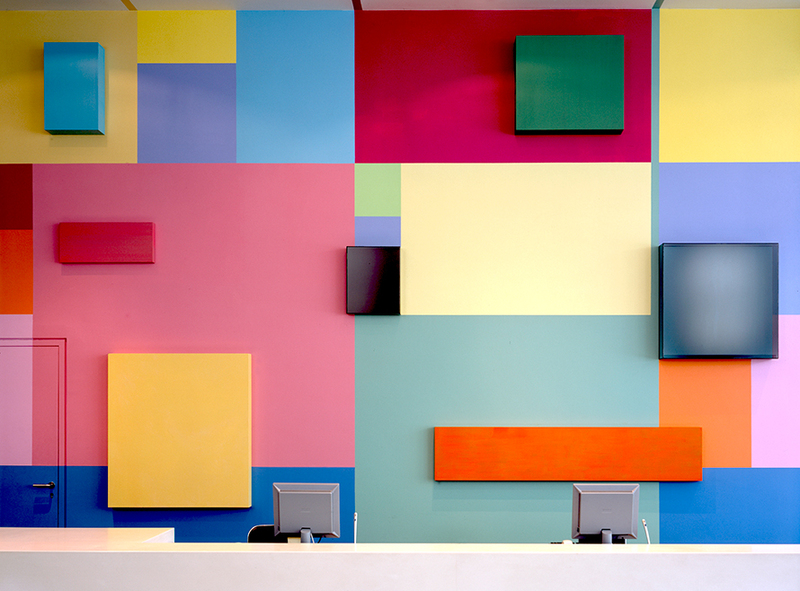 Artist Simon Patterson installed a large wall mounted work based on the designs of WWI Dazzle Ships. This was located in the public area inside, near the reception area. And artist Elizabeth Wright also completed her proposal for elements of street furniture and lighting that punctuated the main pedestrian pathway outside, linking the new facilities, collaborating with Landscape Architect Christopher Bradley-Hole. 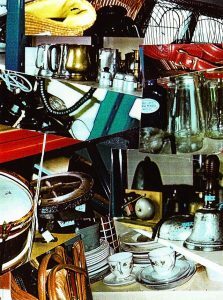 Sound artist Bill Fontana produced a temporary sound work based upon the groundbreaking activities of the Broadcasting House’s Sound Effects Store and the objects assembled for decades of foley work. Artist duo, Bertrand Saugier and Pascal Thivillon (AKA – Dig Ding Dong) also introduced their process led revelation of stories associated with White City. 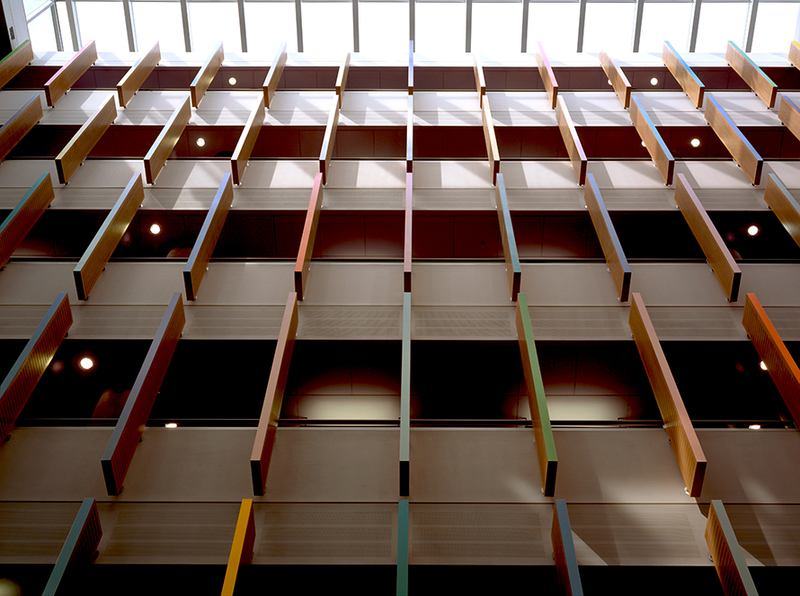 Saugier and Thivillon were the first artists in residence at BBC White City. Their work revealed the ‘ghosts’ they found on the site as the subject of an exhibition in February 2003. Isabel and Rebecca also worked with senior figures within BBC management at the time, like Alan Yentob to select work from the Arts Council Collection, arranging a five-year loan period. The consignment featured work by artists that included Leon Kossoff, Richard Long and Tess Jaray. 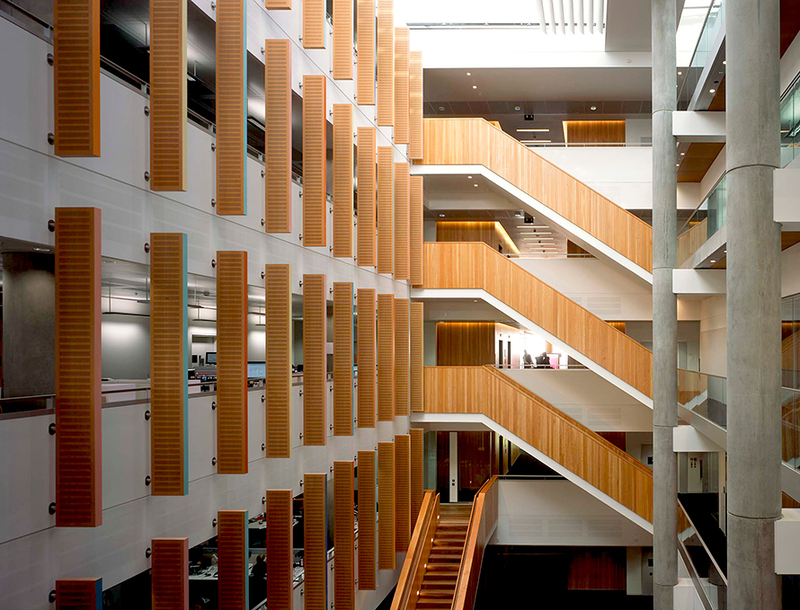 Their work was located in the more public meeting rooms, reception and circulation areas. There was a series of floor texts built into the paving and wall stickers designed by John Morgan that came from BBC Voices Of White City. The project was championed by Andrew Motion, the Poet Laureate. This scheme was realised in 2005 and unfortunately was the last to be installed at White City. The BBC Media Village art programme was curtailed by the change in circumstances at the BBC following their move to Salford in 2004 and the planned expansion and redevelopment of Broadcasting House. 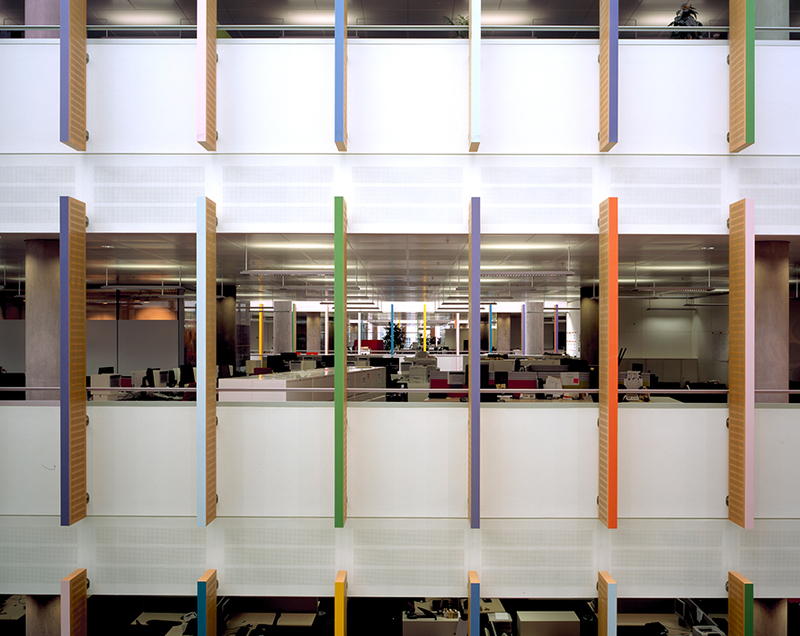 The Broadcasting House redevelopment marked the establishment of a further set of public art commissions that followed the strategy. The commissions for the new building were proposed and realised by Vivien Lovell and her team at Modus Operandi. 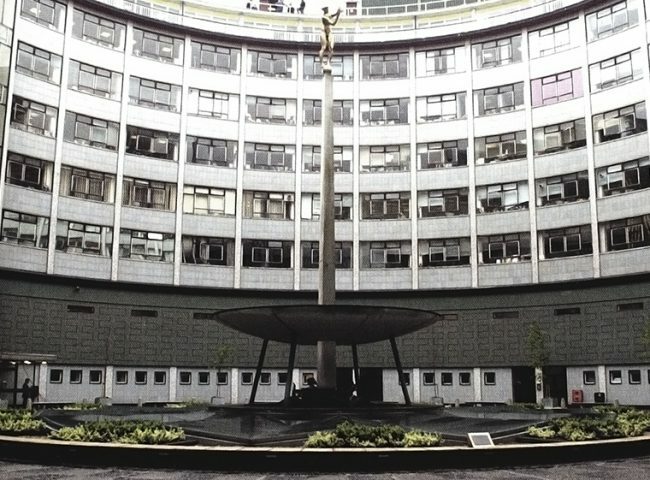 Following the reappraisal of the BBC’s property portfolio Television Centre and then White City One, Media Centre and Garden House were subject to multi-million pound property deals, and were sold to reduce the capacity of the BBC property portfolio.